I was at Fort, in South Mumbai, a couple of days back to shoot at what is possibly Mumbai’s oldest running restaurant, Pancham Puriwala. You can catch that video here. After the shoot I went to pick a Sony wifi point and shoot camera, K’s birthday gift to me, at a camera shop there. Having lost two DSLRs and damaged a mirrorless in the past, it had to be the phone or a point and shoot at the most. I bought the camera and then ambled down to Ideal Corner for dhansak. It was but apt that the first pic taken by a camera given by a Bawi (Parsi lady) is that of a Parsi dish. I got talking to Parvez Irani, the ever smiling owner of Ideal Corner. He introduced me to his business partner, Shiraz Irani. Parvez has recently introduced a continental line in the restaurant along with the Parsi food. Parsis, of course, have always felt the need to carry on where the British left off and consider old school ‘conti’ as Parsi food too. Interestingly Parvez now keeps his restaurant open on Sundays (Mondays shut) and at nights too. Many places in Fort, including Ideal, used to be shut at night. Traffic is slow at the nights he tells me. I am sure it will pick it up. I like these efforts made by traditional restaurant owners like Parvez to become more user friendly and move with the times. 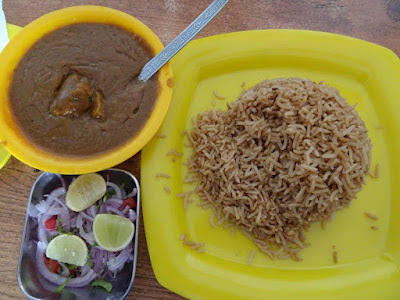 My lunch of a mutton dhansak cost me Rs 190. The chat was free and Shiraz shared a bite of laganu custard with me and Parvez a bit of his Parsi channa dal staff lunch. But a brilliant lunch at Rs 190! Seriously? 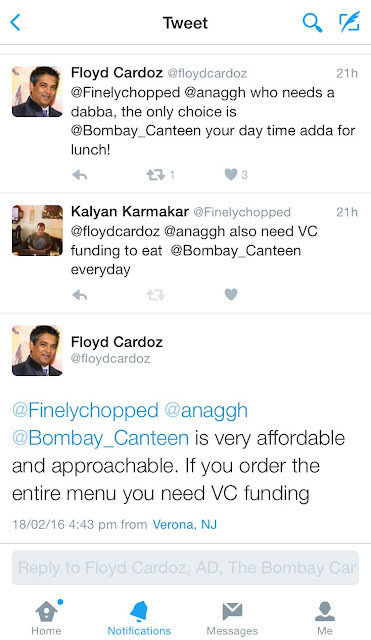 That’s the beauty of Fort versus the new business centres of BKC or Lower Parel. Do check out my video on the eateries of Fort. As I was telling Floyd Cardoz of The Bombay Canteen, having lunch at new age restaurants like his everyday would require some serious VC funding. He sportingly denied it of course. Incidentally, I did a twitter poll on what people do for lunch at work in Mumbai and this is what came out. I later realized that I hadn’t given office canteen as an option. Possibly because I have had such lousy experiences with them. One place which hardly gets talked about for its food in Mumbai is Bandra East. The quieter, unassuming, largely Maharashtrian residential neighbour of young and glitzy Bandra Kurla Complex (BKC). While BKC, the new CBD of Mumbai, has some of the newest, fanciest and poshest of restaurants in the city these days, Bandra East has quite a few hidden gems too. And I am not just talking of Highway Gomantak. Bandra east primarily has a few public sector government office buildings though of late there are a couple of public sector ones too like the Hallmark Building which I go to. I have been going to Bandra east on work for the past few months. 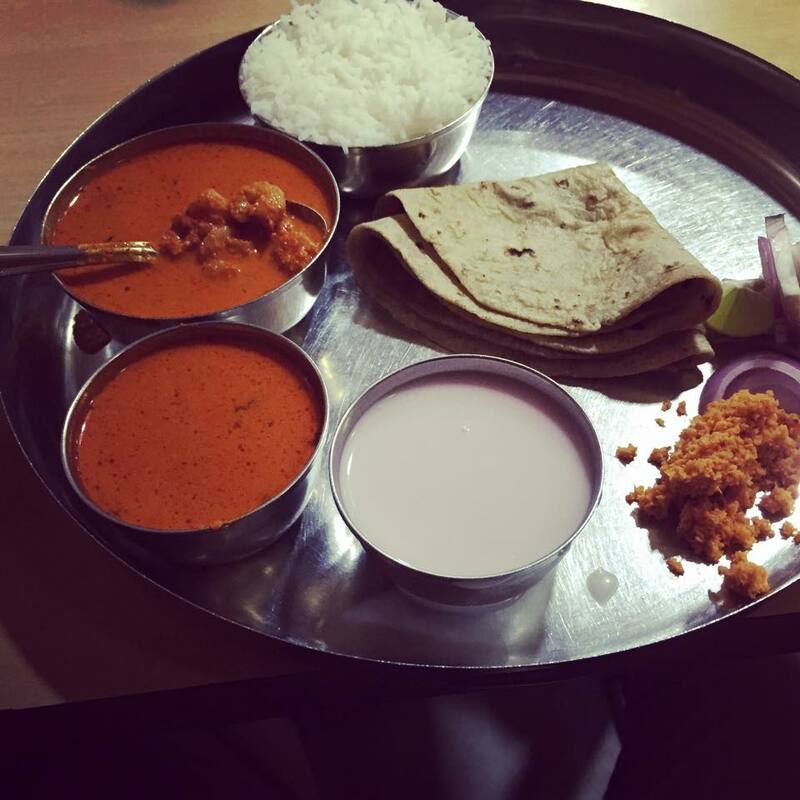 I have explored the food around Bandra East when I go there. 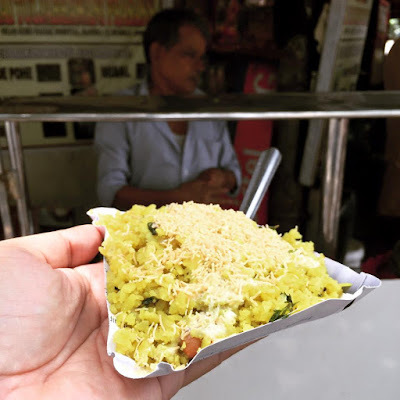 After about 6 months or so of bi-weekly trips to the area around Guru Nanak Hospital, I have come up with a list of food places I keep returning to. I have written in detail about some of them on the blog. Here’s putting them as a day’s trail. 4. Sri Krishna Fast Food: This is a street food joint again. Open through the day. Packed with people. 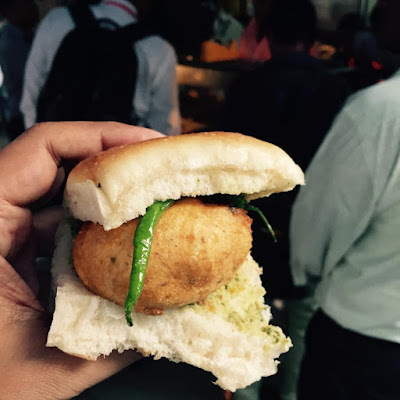 The freshly fried vada pav (Rs 12) here is the stuff of legends. 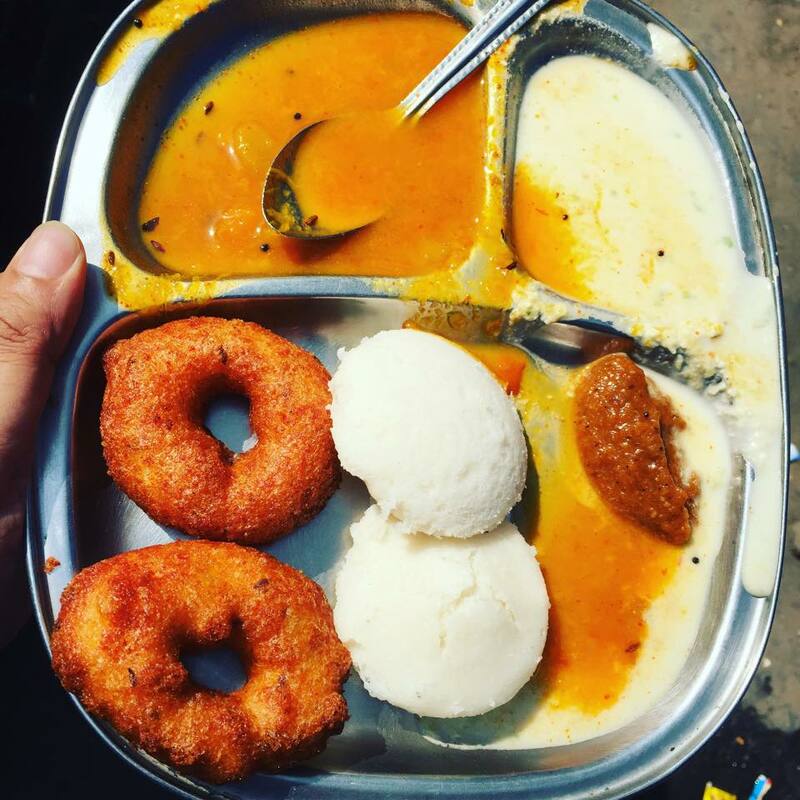 If it is served fresh from the pan (the only way to have it) then let the vada cool or it will singe your mouth. If you find it too spicy, then have the dahi kachori (Rs 20) as dessert. The samosas are popular here too but are too spicy and big for me. Here’s my post on them. This is my post on them. 5. 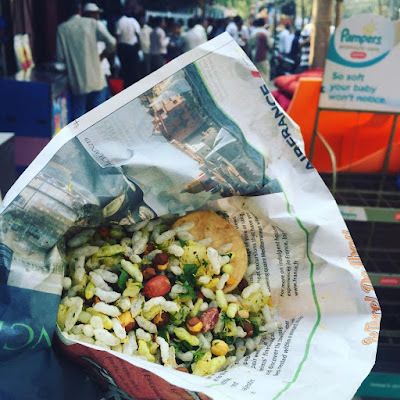 Maharashtra channa bhandar: If a vada pav seems too sinful for you then you can try a sukha bhel at the Maharashtra channa bhandar next door. Sukha bhel (Rs 20) doesn’t have the sweet tamarind chutneys of regular bhel. They will ask you for your preferred teekha (chilli) levels here. You get regular bhel and sev puri too which are on the sweeter side. This is a Maharashtrian run shop in a Maharashtrian dominated area. 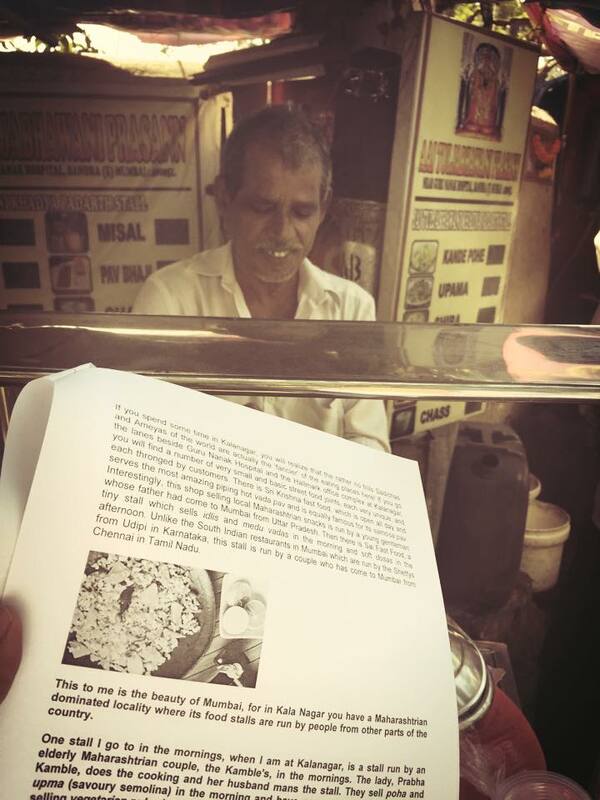 Not so fair to blame the sweetness in bhel on Gujaratis and their love for sweet then perhaps? You can see some of these places in Alex Hunter’s excellent Mumbai episode in the Attache series where he met up with me on the way to his hotel from the airport to talk about Mumbai’s food. Coincidentally my friend, Harshad, shared this video on Facebook just as I began writing this post. How's that for serendipity? 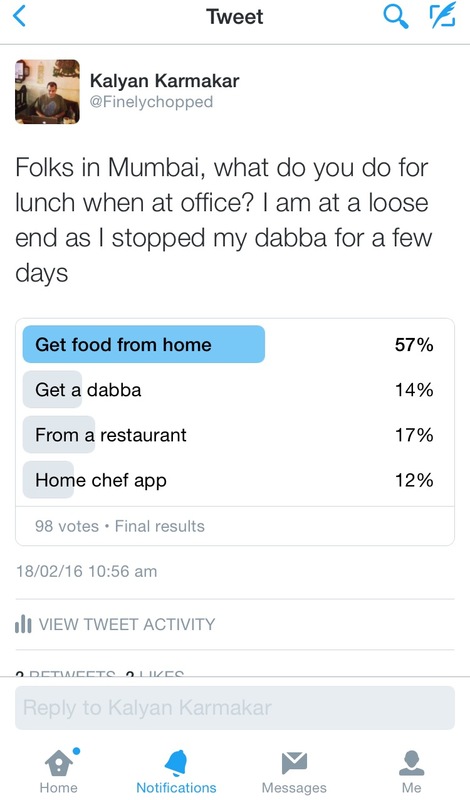 So here's wishing you a day of happy eating in Bandra East. Hey, nice guide to the Eastern side of the Queen... Give Amber a shot if you're venture towards the station... their Mutton Manchow Soup is interesting and you'll love the custard.